The AP’s West regional editor, Traci Carl, said the news organization’s attorneys were reviewing the ruling and considering the legal options. “The AP is disappointed with the ruling and believes the public has a right to know the terms of the settlement,” Carl said. Neither Riggs’ attorney James Huegli nor CCA’s attorney Kirtlan Naylor immediately returned messages from The Associated Press seeking comment. Riggs initially asked for $55 million in damages, saying the Idaho Correctional Center was nicknamed “Gladiator School” and that guards knew Riggs was about to be attacked but failed to protect him. The judge also noted that a settlement agreement in a “companion lawsuit” between other inmates at the prison and CCA was released to the public. In that case, the inmates were alleging the same types of civil rights violations that Riggs claimed, but they didn’t ask the court for any monetary damages. Instead, the inmates wanted changes to the way the prison is run — and in the settlement agreement, CCA agreed to make those changes, though the company did not acknowledge any guilt or liability. Both CCA and the American Civil Liberties Union of Idaho, which was representing the inmates, agreed to make that settlement public. If Bob Henry prevails on appeal in his public records lawsuit against Canyon County, the result could end up helping the county in a separate Bujak-related legal struggle. That’s because the trustee in former county prosecutor John Bujak’s bankruptcy case is suing the county for nearly $1 million based on the presumption that Bujak’s contract to use county resources to prosecute Nampa misdemeanor cases was his private property. Trustee Jeremy Gugino wants proceeds from the contract to be divided among Bujak’s many creditors as part of the Chapter 7 proceedings. The county is one of those creditors, claiming Bujak still owes it about $300,000. That presumption is supported by a district judge ruling in Henry’s public records lawsuit last year, but Henry now hopes that the state’s highest court will determine that ruling was in error. If the Nampa contract is declared public record, that would bolster the county’s argument that the money it has collected from the contract is rightfully the county’s and not part of Bujak’s assets for distribution, Henry said. Trustee Gugino could not be reached for comment Friday. His case against Canyon County is scheduled for a pretrial hearing in U.S. Bankruptcy Court Dec. 21. At Friday’s hearing, the Idaho Supreme Court didn’t indicate how long it might take to reach a decision in the appeal. But Henry said he was heartened by some of the justice’s questions and statements that seemed to echo his belief that Canyon County commissioners were wrong to support Bujak’s contention that the nearly $600,000 contract was private and appropriately deposited into his private account, with the expectation that the lion’s share of the money would end up in county hands. But Bujak resigned Sept. 30, 2010, after he couldn’t turn over the approximately $300,000 commissioners said he still owed from the contract. County commissioners have said they relied on their then-prosecutor to be true to his word, but he fraudulently used the Nampa money for his personal expenses. He denies he owes the county any money. The county’s legal team contends Henry’s appeal in his public records case is moot, because once the county gained access to Bujak’s financial records through the bankruptcy proceeding, it provided them to Henry. After Bujak resigned, the county made the Nampa contract and its financial records public, Erickson said. But despite repeated questioning from the justices, he stopped short of saying county officials now believe the contract should have been treated as a public agreement all along. 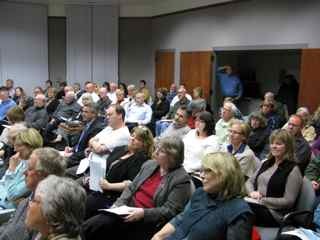 The session was an eye-opener for some in the audience, including one who’s been working with a county task force and who realized he may have slipped up on open meeting law requirements. “I MAY be in a hell of a lot of trouble,” he wrote in his evaluation, adding three exclamation points; he conferred directly with Idaho Attorney General Lawrence Wasden after the session on the steps he should take to make sure he’s in compliance. Issued covered included recent changes in the law, including a “cure” process for agencies that allows them to correct an open meeting law violation, and new fee provisions for public records that require any labor charges to be clearly itemized and charged at the hourly pay rate of the lowest-paid employee qualified to handle them, and also make, in most cases, the first two hours of labor and 100 pages of copies free. There’s more information at the IDOG website, www.openidaho.org. IDOG stands for Idahoans for Openness in Government; Wasden’s office partners with the group in the open-government education project, which also is supported by the Idaho Press Club, the Idaho Association of Cities, the Association of Idaho Counties, and receives grant funding from the John S. and James L. Knight Foundation through the National Freedom of Information Coalition. The Lewiston session wrapped up a week-long run of well-attended open government seminars in North Idaho, starting in Sandpoint on Monday and also hitting Coeur d’Alene and Moscow. A Boise session likely will be held this spring. Despite stiff competition – a hard-fought UI basketball game against the Washington State Cougars and the downtown holiday lights parade – nearly 40 people turned out last night for IDOG’s open government seminar in the ornate, wood-paneled, hundred-year-old City Council chambers at Moscow City Hall. Those attending included the mayor, city and county attorneys, reporters and editors, academics and clerks, elected officials, interested citizens and agency staffers who deal with open records and meetings questions daily. 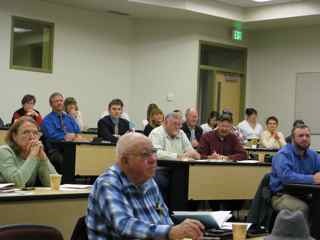 The session was co-sponsored by the Moscow-Pullman Daily News. Attorney General Lawrence Wasden told the group that some might think someone making a public records request is “just fishing.” But, he said, “The public records act is a license to fish.” Public records have to be disclosed to the public. 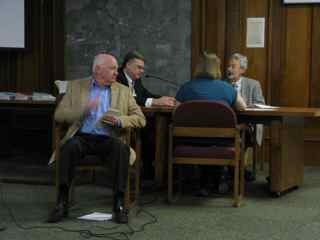 In humorous skits exploring what the public records and open meeting laws require, Moscow City Councilman Walter Steed, shown here, portrayed a lucky reporter – seated next to three county commissioners at a cafe, who are busy illegally conducting the county’s business as he overhears. (The commissioners were portrayed by Kenton Bird of the UI, Moscow City Attorney Randy Fife, and Moscow-Pullman Daily News staffer Kelcie Moseley). The scenario is actually based on a real case in Idaho. The IDOG seminars move to Lewiston tonight. SANDPOINT — Attorney General Lawrence Wasden knows that citizen participation is an essential ingredient for democratic government. That’s why he’s on the road educating Idaho city officials and residents alike about state law regarding the rules of open government and the specific cases where secrecy is permitted. Wasden, along with Idahoans for Openness in Government President Betsy Russell and Deputy Attorney General Brian Kane, visited Sandpoint Monday to kick off a week of seminars on the subject. “I hope that the people who attend these meetings walk out the door knowing more than when they walked in the door,” Wasden said. According to event organizers, the Sandpoint seminar was remarkably successful. More than 40 people showed up for the two-and-a-half hour event, including county commissioners Lewis Rich and Mike Nielsen and Sandpoint mayor-elect Marsha Ogilvie. Wasden said that clarification on open meeting and public records law is more necessary than ever. Based on the open government cases his office has examined, the split between the individual seeking information and the government office being in error is close to an even split. The fact that both sides are wrong half the time indicates to Wasden that education on open government needs improvement. “.500 might be a good batting average in baseball, but we need to do better,” he said. The seminar covered the protocols of executive session, planning and announcing meetings, the cases where government is allowed to keep information classified and the types of documents and communications that qualify as public record. The latter in particular proved enlightening — any written form of communication used to conduct public business, even e-mails and texts, are subject to public records requests. Kane said that the easiest way to ensure openness in government is to make that an office goal from the beginning. Rather than abusing executive session privileges and searching for legal loopholes, an active effort to keep the public informed can go a long way. “If you approach the law looking for ways to get around it, you’ve already violated it,” Kane said. If they’re making a decision, make yourself at home. If they’re holding deliberations, pull up a chair. But if a government entity is discussing personnel issues, say, hiring an employee or disciplining an officer, the door will be shut to civilians. No use complaining. It’s the law. The open meetings law, specifically. And it’s there for a reason, explained Idaho Attorney General Lawrence Wasden on Tuesday night. 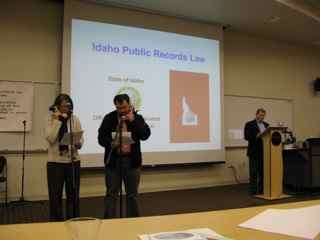 Idaho’s open meeting and public records laws might seem like dry subjects. But if anyone wants to hear a highway district deliberate on a tax increase, or wants a copy of an email between school board members, the information is useful. 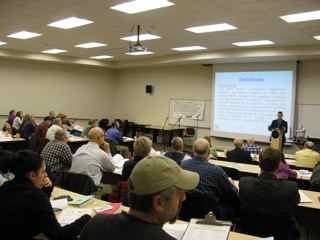 That’s why the attorney general, with Idahoans for Openness in Government, held a seminar on the restrictions and allowances of the two recently updated laws on Tuesday. “Everybody, even if you sing out of tune, you’ll recognize there’s a sheet of music,” Wasden said at the event, co-sponsored by the Coeur d’Alene Press and the Spokesman Review. The state’s open meeting law, Wasden said, ensures that almost every discussion and decision by a governing agency is open to public viewing. Officials discussing policy privately at a restaurant, for instance, is illegal. “You’ve been trusted with the public’s right to watch you conduct your business,” he said. Deputy Attorney General Brian Kane spelled out the rules: An agency must provide notice of a meeting five calendar days ahead, and notice of the agenda 48 hours ahead. Policy making outside of a noticed meeting is null and void, he said. The law allows folks to observe, he added, but not participate. “If you want to give (government officials) a piece of your mind, make an appointment to meet with them,” Kane advised. Meetings for executive sessions, where members of the public may be excluded, must be specified on an agenda 24 hours ahead, he noted. Decisions can’t be made in executive sessions, Kane said. Discussions are limited to a very narrow scope of subjects, like personnel and litigation. Members of the public can record meetings, he said, so long as it doesn’t hamper the process. For more about Idaho’s open meeting law, go to www.openidaho.org. Complaints about violations at the local government level should be taken to the prosecuting attorney, Kane said. Violations by state agencies should be reported to the attorney general’s office. Kane noted that though officials can be charged up to $500 for knowingly violating the open meeting law, they can avoid fees by admitting error and holding a meeting again properly. As for Idaho’s open records law, Wasden said, the custodian of a government document can’t deny a record request or question its intent, unless about it being used as a mailing list. “A public record is a public record,” Wasden said, adding that there are some exemptions like personnel and litigation documents. Accessible records include handwritten and typewritten documents, photographs, photostats, emails, phone texts and Facebook pages, property tax records and government credit cards. “If you’re spending public dollars, the public has a right to see what’s going on,” Wasden said. Kane noted that an agency can grant or deny a records request within three working days, or within 10 working days if more time is needed. Under the new statute, the first two hours of labor for obtaining a record, or the first 100 pages, are free. Wasden had simple advice for government employees about not leaking embarrassing intel. It’s a balmy 28 degrees in Sandpoint this morning, where last night more than 50 people packed the public meeting room at the Sandpoint Library to learn about Idaho’s open meetings and public records laws. “Open meetings and public records are very important to us as a citizenry,” Idaho Attorney General Lawrence Wasden told the group. It was the first of four North Idaho seminars this week sponsored by Idahoans for Openness in Government, IDOG, in partnership with the Attorney General’s office and recommended by the Idaho Press Club, the Idaho Association of Counties and the Association of Idaho Cities. Last night’s seminar was co-sponsored by the Bonner County Daily Bee; publisher David Keyes said the turnout shows people here really want to know about these issues. Among the points that got a lot of attention last night: The Open Meeting Law says the public can attend the meeting, but doesn’t say they can speak or participate; it just guarantees that citizens can observe. E-mails are public records. Agencies can’t take 10 days to decide whether or not to release a public record in response to a request; that decision has to be made within three days – the law only allows taking up to 10 days to provide the records when it takes longer than the specified three days to locate or retrieve them. And a new law passed this year makes the first two hours of labor and the first 100 pages of copies free of charge in public records requests, excepting only those records for which there’s a separate fee-setting statute, such as records in court files. “What this means is that 90 percent of your public records requests are going to be free,” Deputy Attorney General Brian Kane told the Sandpoint crowd. Tonight, it’s on to Coeur d’Alene, where there’s been high interest, followed by Moscow on Wednesday and Lewiston on Thursday. Full disclosure here: I’m the president and a founding board member of IDOG. 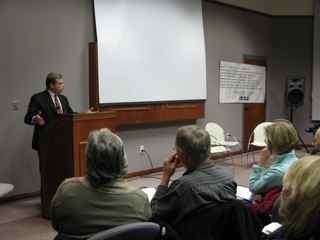 Last night was IDOG’s 20th open government seminar since 2004, and the first in North Idaho since 2005; Attorney General Wasden has led every seminar. There’s more info, including an online guide to these laws, at www.openidaho.org. POCATELLO, Idaho (AP) — The Idaho Supreme Court has upheld the dismissal of a lawsuit filed by an Idaho State University professor who claims he was wrongfully terminated, but ruled that a lower court wrongly found the former professor, Habib Sadid, had no First Amendment protection for his comments in a local newspaper critical of the university’s administration. Faculty leaders at the southeastern Idaho school were pleased with the decision from the Supreme Court, which found that Sadid was not the victim of retaliation and that his employment with the public university did not strip him of his right to free speech as an individual. Sadid was suspended from the university in August 2009 and terminated a month later for what administrators called unprofessional and insubordinate conduct. But Sadid said his history of speaking out about campus problems led to his termination; he had written letters to the editor and guest columns and ran a paid ad in the local newspaper with his criticisms. His legal battle over his termination has gained financial support from groups including the American Association of University Professors, the American Federation of Teachers and the Foundation for Individual Rights in Education. While the lower court Sadid’s criticisms of his employer did not involve issues of public concern, the Idaho Supreme Court found that the professor’s critique of plans to create a medical school at the university did constitute a matter of public concern. It also found that the published criticisms weren’t “pursuant to his official duties” as a public employee, which would have eliminated his free-speech protections against workplace retaliation. Sadid sued the university in state court in 2008 while he was still employed at the school, but the case was dismissed; he claimed then that he was retaliated against for publicly voicing his discontent with administration policies, including by not being appointed chairman of the university’s Department of Engineering. The court found no evidence that he was retaliated against at that point. Sadid has other state and federal lawsuits pending over his dismissal. Officials at the Pocatello university lauded the decision of the high court to affirm the dismissal of the 2008 case. “We’re pleased with both the decisions of the Idaho Supreme Court and the district court,” Kent Tingey, vice president for university advancement, told the Idaho State Journal (http://bit.ly/qPO7Yr ).